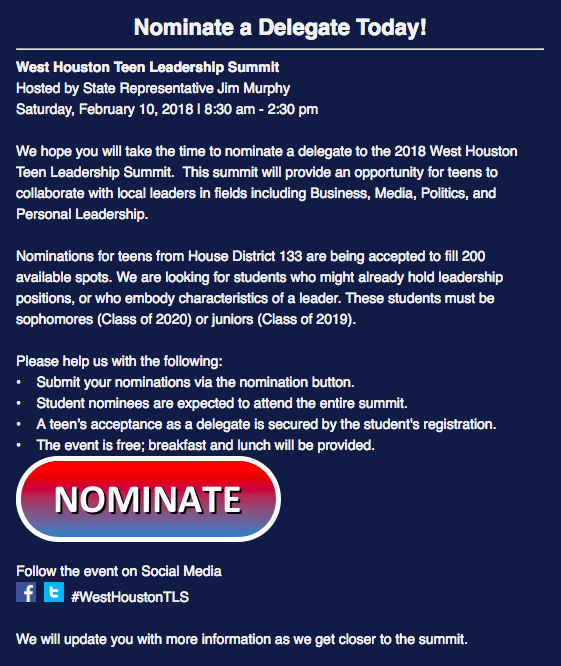 West Houston high school sophomores and juniors will connect with local executives, politicians, and community leaders at our third biennial West Houston Teen Leadership Summit. 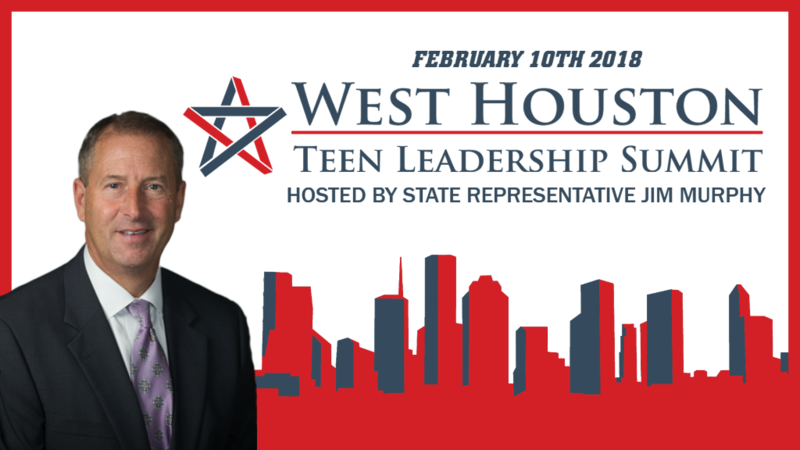 I am happy to host this event again and continue the tradition of developing teen leadership skills. The 2018 summit will be held on Saturday, February 10 at the Norris Conference Center – City Centre, in the heart of House District 133. While we don’t know exactly what the future looks like, we can get an encouraging glimpse from today’s young people. They will shape the future and we want them to know that it begins today. It is important that we train them to engage in leadership roles, network with current leaders, and get to know their community. We invite each West Houston high school to send their nominees to the biennial event. In addition to the school nominations, places have also been allocated to At-large “Community Delegates” to complete 200 delegate spots. Over 20 area high schools participated in the 2016 summit. The summit is held free of charge for all attendees, due to the generous support of the event sponsors. 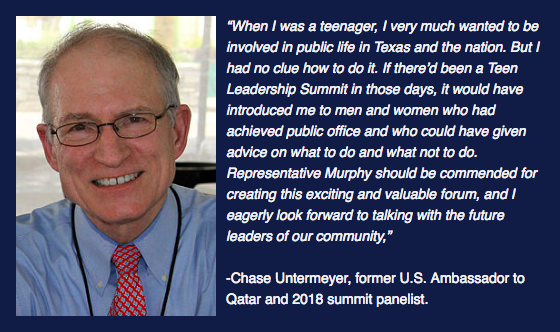 The Teen Leadership Summit draws top Houston-area leaders to participate on panel discussions and smaller break-out groups. 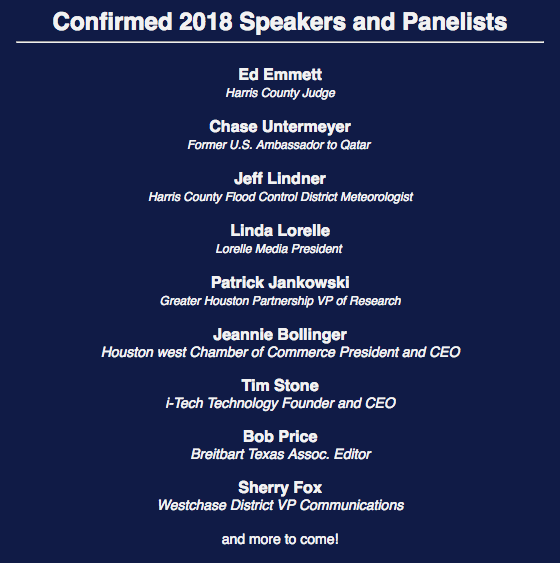 Confirmed 2018 speakers include Harris County Judge Ed Emmett, former U.S. Ambassador to Qatar Chase Untermeyer, Lorelle Media President Linda Lorelle, Councilman Jerry Davis, Harris County Flood Control District Meteorologist Jeff Lindner, and over 20 additional community leaders. I hope that you take a moment to think of a teen in your community who deserves this opportunity, and nominate them to attend. It is a fantastic event and one they won’t forget. 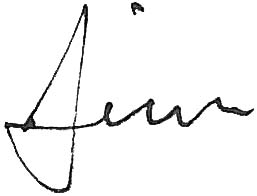 The information is in this edition of the newsletter.